The spine has a normal curvature that allows the weight to be supported in an upright posture. An exaggeration or an abnormality of this curvature is known as Kyphosis, and the most serious type is Scheuermann’s disease. 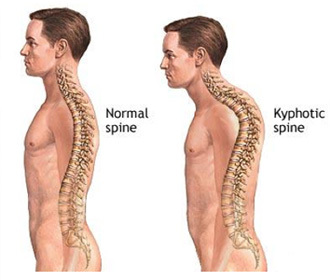 Most common in the upper back (the thoracic spine), Kyphosis is generally thought to be caused by abnormal growth of the vertebra in which the front part stops growing before the back part does. This growth abnormality causes wedge-shaped vertebral bones, which cause a forward-bending posture. Kyphosis may also be caused by vertebral compression fractures (due to osteoporosis) or degenerative bone conditions, such as arthritis. In Scheuermann’s disease, boys are affected more often than girls, and the first signs usually appear in adolescence. The upper back gradually appears more rounded, and there may be accompanying back pain that worsens during the day and decreases with rest. Pain, if present, is typically felt at the most curved point of the spine and can be aggravated by activity or prolonged periods of sitting and/or standing. Diagnosis is usually made following a physical examination and X-rays of the spine to measure the “kyphotic angle.” When this kyphotic angle, roundness of the upper spine, is greater than 45 degrees is considered kyphosis. See an orthopedic specialist to discuss proper Kyphosis treatments based on the cause of the condition and symptoms. Click on the button to book an appointment or call us at 1-888-409-8006.